Heat the oil in a cast iron or heavy medium skillet. Place the tempeh in the skillet and fry until golden. Flip over and fry the other side until golden. Add the water and shoyu. Cover and bring to a boil. Reduce the flame to medium-low, and simmer for 10 to 15 minutes or until all water has evaporated, flipping the tempeh from time to time. Turn the flame to high the last few seconds, cook off any remaining liquid and brown each side of the tempeh. Remove and allow to cool. While the tempeh is cooling, prepare the mayonnaise. Place the Edensoy in a blender, set on high speed, and press blend. Combine the oils and slowly (several drops at a time) add the oil to the Edensoy until all oil is blended and the mixture becomes very thick and creamy. This will take several minutes. When thick add all remaining ingredients, and blend several seconds until well blended. Remove and place in a serving container. When the tempeh is cool enough to handle, cut into 1/4 inch thick slices or strips. Place 1 lettuce leaf on top of each piece of bread. Place the tempeh on top. 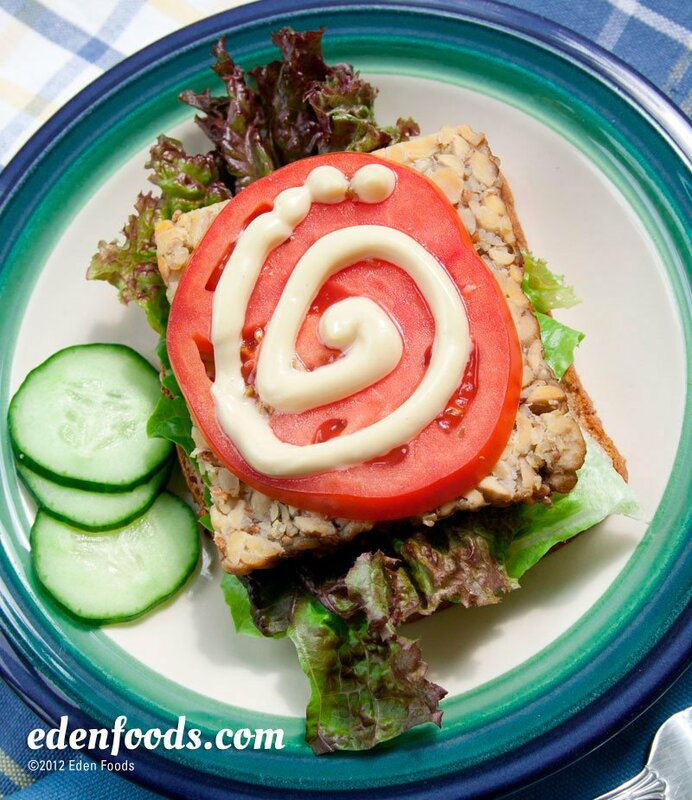 Spread mayonnaise over the tempeh. Place a tomato slice on top. Serve whole or cut the sandwich in half before serving.